« Does the Mitral annulus dilate with LA enlargement ? Why some “Medical Truths” need to be so brutal ? I frequently refer to one of the most famous medical quotes made in last century by a Harvard professor Dr Herbert Lay in 1969. 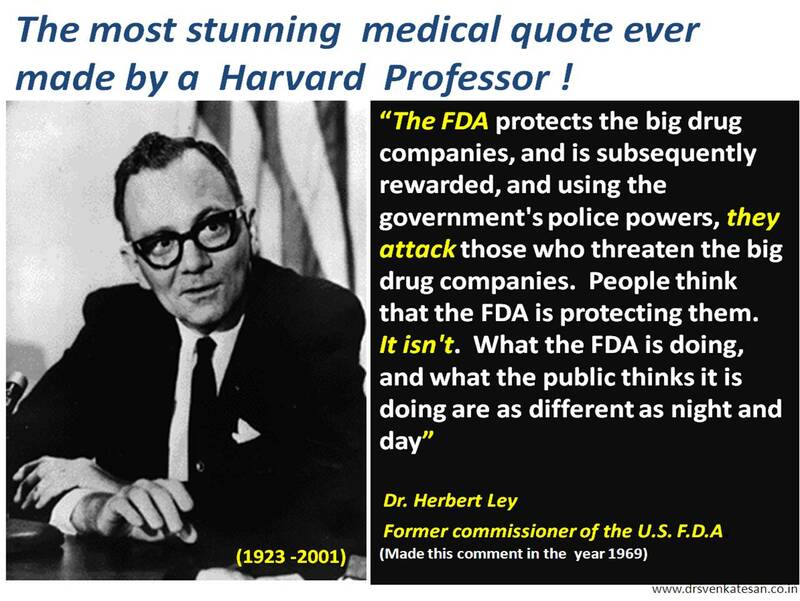 Five decades have gone since this observation was made by Dr Ley .Mind you ,Dr Ley is not a lay person , he was heading the same FDA which he targeted ! I guess when Dr Ley made this statement there was little commercialization in pharma Industry . Now along with it an entirely new field of medical device industry has grown to gargantuan proportions ! I wonder what Dr Herbert Ley would have to say as on 2014 ! Many modern medical professionals would shrug these views as controversial , pessimistic and negative forces of science ! it’s indeed stunning. One normally regards FDA as a highly professional regulator with no axe to grind. Your mention of medical device industry is highly relevant in this context. Only the other day(10days back, i think), AIIMS doctors have categorically said that annual medical check up is a total waste. With medical costs escalating, even in the US there is a growing realization about redundancy of annual check ups. I won’t be surprised if there is an unhealthy nexus between the device manufacturers and the decision makers! Thanks for highlighting issues with regard to medical ethics. Your other article on prescription & promotion of Statins is also enlightening. I was always suspicious of high dosage levels of statins being prescribed by some physicians. I had undergone bypass surgery in 2008 in Mumbai and am taking only 5mg Statin(Aztor) for what it is worth. I focus more on diet and regular long & brisk walks to maintain my cholesterol levels. Well, It takes a medical professional to expose the malpractices in pharma industry as well as medical profession! I would like to meet you next time I make a trip to chennai. May kindly provide your contact details.